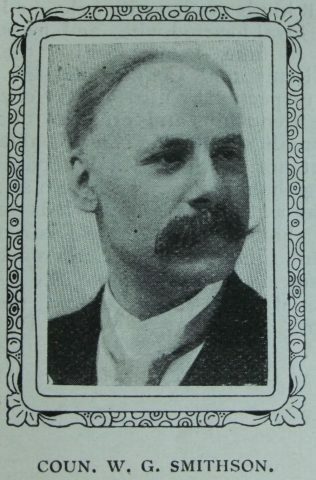 Councillor W.G. Smithson is a Primitive Methodist of the third generation and enjoys all the advantages of a gifted and godly ancestry. He was born in Whitby in 1860, and after being trained by our Sunday school, became a teacher at the early age of twelve years. His conversion took place when sixteen, under the earnest ministry of Rev. Matthew Rearley, and in later years he was much helped by that of Rev. H.B. Kendall, B.A., and Rev. W.A. French. For a period of twenty-five years he has rendered unusually able service as a local preacher, making the most thorough preparation, and realizing very considerable success in the work. His sermons are always intelligently conceived, broad in outlook, spiritual in tone and forceful in delivery. For professional reasons he has resided successively at Middlesbrough, Belper, Bingley, and Leeds, and in each place has rendered loyal and efficient service to our Church. As an architect he has won the highest possible diploma, has been appointed vice-president of the Leeds and Yorkshire Architectural Society, and is still a member of its Council. Among our own people he has also won appreciative recognition, having held the position of Circuit steward, delegate to District Meeting and Conference, Secretary of the Leeds Primitive Methodist Council, and Vice-President of the District Local Preachers’ and Ministerial Associations. Whilst responding to these larger claims he is loyal in his attachment to the small village church of which he is the appointed leader, and renders good service on the Urban District Council for which he has exceptional qualifications. He is yet in the prime of manhood and we trust may long continue to serve the various civic and religious movements in which he is so deeply interested. William was born abt 1860 at Whitby, Yorkshire, to parents Thomas and Ann. Thomas was a shipwright. William married Anne Elizabeth Langley (abt1859-1922) in the summer of 1882 at Whitby, Yorkshire. William died on 24 January 1949 at Whitby, Yorkshire.